Childish Gambino‘s most recent clip for “Feels Like Summer” stirs the pot once again with a specific scene which shows Michelle Obama comforting Kanye West. The animated video for the RCA-released song depicts Gambino walking down the street of a suburban neighborhood and encountering a host of hip-hop stars engaging in various unusual activities, ranging from Drake chasing down Future on a bicycle to Nicki Minaj and Travis Scott playing with children’s blocks. During a dream sequence, a crying Kanye West is seen wearing a Make America Great Again hat and is being consoled by the former first lady. Fans were understandably upset, with some of the more angry viewers seeing the moment as an insult to black women, while others believed Obama represents Kanye’s late mother. Check out the video and the Twitter reactions below. 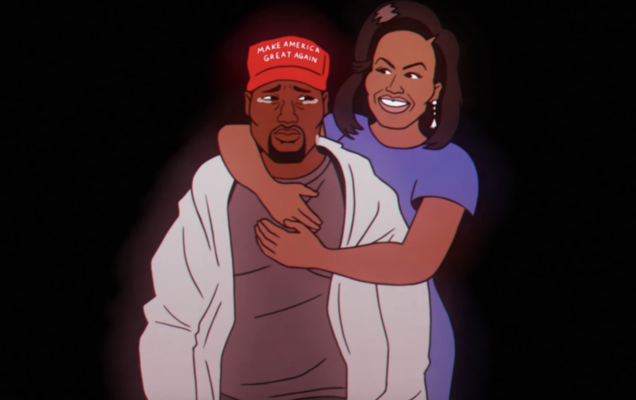 Michelle Obama comforting Kanye West in ‘Feels like Summer’ video was suppose to depict her being a mother like figure for Kanye being that Kanye seems lost in life and doesn’t have a mother.